Check Your 6! from The Lordz Game Studio brings the air combat board game of the same name to the digital world. 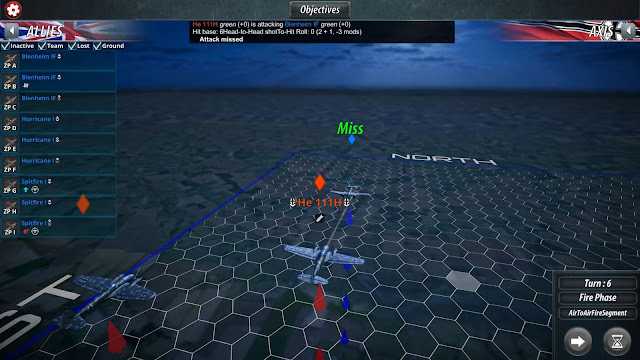 Although the board game includes many expansions covering various theaters and eras, this initial release for PC focuses on the classic Battle of Britain clashes between the RAF and Luftwaffe. Check Your 6! uses a we-go turn-based system where each side plans out the orders for all of their aircraft and then hit go to see what happens. However, it's quite a bit more complicated than just that, as we will see. When planning your movement for a turn, there are multiple factors to consider: where your aircraft is now, where you want it to be on the next turn, or three turns from now, and of course where the enemy aircraft are. Movement includes steering left and right, altitude adjustments, fancy maneuvers, and the ever critical speed. Climbing will slow you down, and diving will similarly speed you up. Going faster isn't always the best option, and so one must think ahead when setting a course. Sharp turns can also slow an aircraft to a dangerous point, forcing you to be judicious with such maneuvers. Mastering movement is a critical part of every engagement; unless you get your aircraft into the proper position, you will have no chance of taking a good shot and doing some damage. When attacking an enemy, several variables are thrown together to give you a percentage chance of success. The angle and speed of the aircraft involved play a role, as well as the distance between them. It's quite difficult in this game to get anything resembling a sure hit unless you are able to maneuver perfectly into position behind an enemy. Often you will be forced by circumstances to take lower percentage shots and hope for the best. Assuming an aircraft is hit, there are all sorts of things that can happen next. Simple hull damage, engine damage, crew casualties, a fire starting, or no damage at all. These variable results can make for some moments worthy of cheer, as well as frustration when things don't go your way. The 18 scenarios available can be played from each side, and all of the ones I played were at least partially based on some sort of real life sortie. You reward for winning a scenario is a nice text blurb describing the real historical result of the action. Otherwise the scenarios are not linked in any way, and you can play them in any order. On the plus side, these scenarios feature much more than simple fighter vs fighter combat. 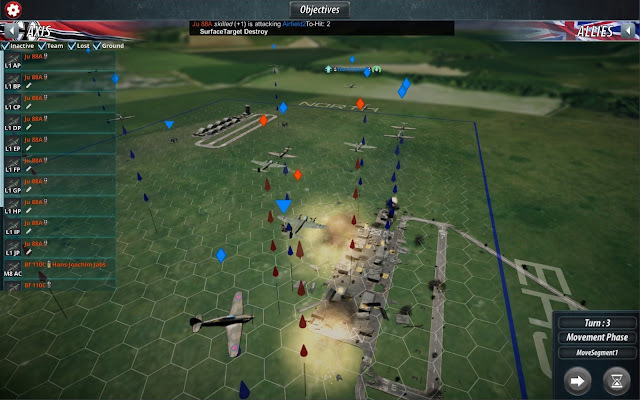 Often one side must defend some kind of objective on the map like a bridge on the ground or bombers in the air. Variable placement of units for each side means that a given scenario could play out somewhat differently from one attempt to the next. There are numerous different aircraft available for each side, and each one has it's own strengths and weaknesses. I know we all want to command a full squadron of Spitfires at every opportunity, but sometimes they just aren't available and you have to make due with what's on hand. Adding a little variability among similar units is how each pilot has their own experience rating. Better pilots essentially "move" last, and so get a chance to adjust their initial orders after seeing if an enemy zigged or zagged. Check Your 6! takes a few hours to really give you a good feeling for the flow of air combat. There is a tutorial which explains the controls well enough, but doesn't give you enough time to really understand how to conduct a dogfight. Thus, I found the game frustrating at first, but then grew to enjoy it a bit more as I gained some experience. You must be able to foresee how running your fighter at full throttle means it will overshoot that bomber it was trying to get behind, or how sharply climbing to meet the foe will leave your guys with no speed remaining to make a sharp turn. I certainly learned these lessons via the school of hard knocks. 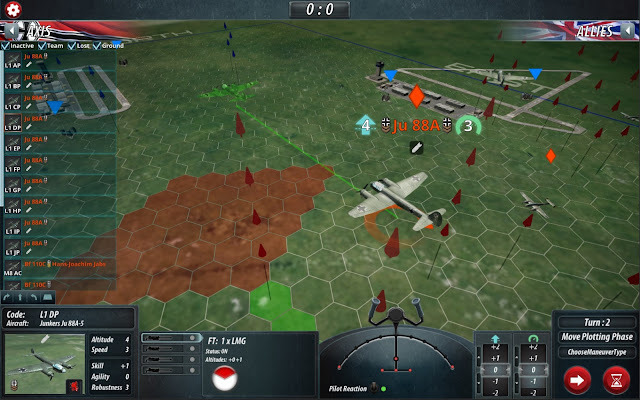 The flow of the combat can be bogged down a lot when you are tweaking movement and facing, and considering the future positions of a dozen different aircraft, but I imagine there are more than a few players out there looking for the exactly that level of control. The game won't dazzle anyone with it's graphics, animation, or sound, but for a board game to digital conversion it looks okay for something that will probably be ported to iPads and the like before long. One thing I found odd were the blurry ground textures, especially in missions where you are attacking ground targets. Overall, I can't really give a broad recommendation for the game, though fans of the board game should be pleased and if you are really interested in turn-based combat and WW2 aviation, you'll probably enjoy it. That isn't to say that Check Your Six! is a bad game by any means, it simply suffers the common fate of many physical-to-PC conversions, in that games which feel dynamic and immersive on a table can feel a bit clunky and slow on the PC. Check Your 6! Can be purchased directly from Matrix Games or on Steam. To be honest I'm not sure why Check 6 was taken on for a PC version...Now if you're looking to convert a popular air war game to PC that will look good and already has a huge following surely Wings of Glory has to be the one, esp when they are looking for a developer. Or you look for a game that's very complex and very realistic and would benefit massively by being converted to PC. A game where the CPU takes on all the complex rules making it far easier to play. 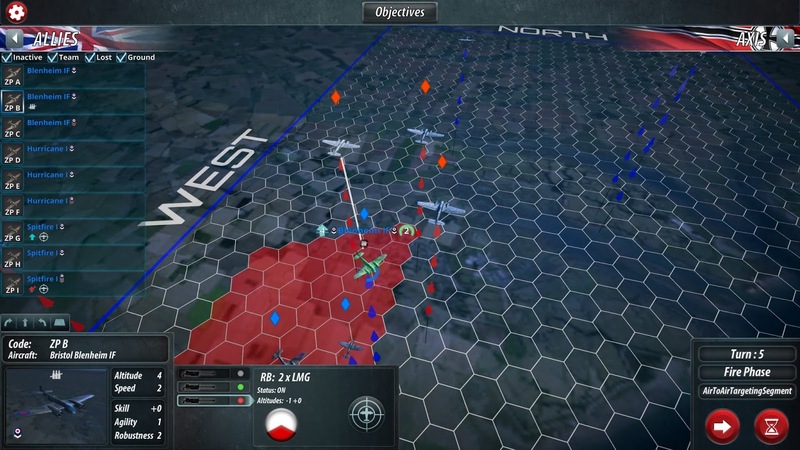 Throw in campaign system for either game, play against AI, and leave door open for DLC like new squadrons of expansions say covering different period of theatre of War with all new planes. Taking this in I'd go for one of the Warbirds games. So either Wings of Glory of Warbirds. Sadly this game is a must seed opportunity. Personally I think the wrong air game was chosen.